ABOUT 80% OF ALL OUT-OF HOSPITAL CARDIAC ARRESTS OCCUR IN PRIVATE RESIDENTIAL SETTINGS SO BEING TRAINED TO PERFORM CPR CAN MEAN THE DIFFERENCE BETWEEN LIFE AND DEATH FOR A LOVED ONE! WE ARE PROUD TO ANNOUNCE THAT WE WE ARE NOW ALSO AN AMERICAN RED CROSS LICENSED TRAINING PROVIDER AND ARE OFFERING CPR/AED FOR THE PROFESSIONAL RESCUER, BLS FOR HEALTHCARE PROVIDERS, ACLS, AND PALS. Come get trained. Save a life. You'll be glad you did! As a American Heart Association (AHA), American Red Cross (ARC), and American Safety Health Institute (ASHI) Training Provider, we offer over 20 various certifications and classes offered. Listed below is a summary of some of our current classes. Basic Life Support (BLS) for Healthcare Professionals: For anyone who is employed or is seeking employment in the medical field: Nurses; physicians; Emergency Medical Technicians; nursing assistants; physical, occupational, respiratory therapists and more. BLS stands for basic life support. Advanced Cardiovascular Life Support (ACLS) for Healthcare Professionals: For emergency care, intensive care or critical care; health care providers such as physicians, nurses, paramedics, and other professionals who may need to respond to a cardiovascular or cardiopulmonary emergency. 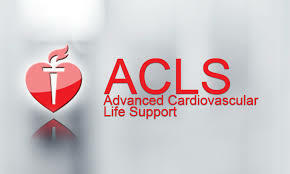 PRE-REGISTRATION IS REQUIRED FOR THE ACLS COURSE. The student must also complete the pre-course self assessment which can be found at www.heart.org/eccstudent. Click on "Pre-course Assessment " Code word: ACLS15. After you complete the pre-course self-assessment, print out the score page, and bring with you to class. Pediatric Emergency Assessment, Recognition, and Stabilization (PEARS) : This course was designed for healthcare providers that infrequently see critically ill children. PEARS prepares a student to assess, categorize, decide and act early to stabilize the child. The main focus of PEARS training is prevention, and specifically the emergency assessment, recognition and stabilization of pediatric victims at risk of severe cardiopulmonary distress. Through unique learning tools, such as video-based simulation, providers can see and hear critically ill children with whom they do not typically come in contact, equipping them to recognize the symptoms of pediatric victims, and thus begin stabilization prior to arrest. This emergency pediatric certification course is video based with instructor-led discussion and simulation. Students participate in, practice and complete various skills and learning stations and are required to pass skills tests, as well as a written test. Key topics covered are: Pediatric assessment Respiratory compromise and arrest recognition and management Circulatory compromise and arrest recognition and management Shock recognition and management Resuscitation team concept. The PEARS certification is a 1 day course. Heartsaver CPR/AED: This course covers scene assessment and safety, Adult CPR (Compressions and Breathing), AED Use, and Adult, Child, and Infant Choking. Heartsaver CPR/AED/First Aid: This American Heart Association (AHA) Adult, Child, and Infant course covers the following topics: Scene Assessment and Safety, Medical Emergencies such as asthma, allergic reactions, heart attack, stroke, diabetes; injury emergencies such as bleeding, shock, wounds, spinal injuries, broken bones and sprains; environmental injuries such as bites, stings, temperature related injuries, and poison emergencies. Adult, Child, and Infant CPR, AED use, and Adult, Child, and Infant Choking. This class complies with all Texas state and federal (OSHA) requirements. Pediatric CPR/AED/First Aid: With specific attention to the primary assessment of the Child and Infant, this American Heart Association (AHA) Child, and Infant course covers the following topics: Scene Assessment and Safety, Medical Emergencies such as asthma, allergic reactions, heart attack, stroke, diabetes; injury emergencies such as bleeding, shock, wounds, spinal injuries, broken bones and sprains; environmental injuries such as bites, stings, temperature related injuries, and poison emergencies. Child, and Infant CPR, AED use, and Child, and Infant Choking. Bloodborne Pathogens: The American Heart Association Bloodborne Pathogens course meets all OSHA and Texas Industrial and Safety and Health Act requirements. This class teaches students what bloodborne pathogens are, how to protect oneself from exposure and what to do if exposed, how to clean up, and how to report any exposure. Wilderness First Aid: Wilderness First Aid (WFA) is an intensive 16-hour program designed for anyone involved in wilderness recreation but is also an excellent class for those wanting an more-in-depth and advanced first aid class or who are concerned about disaster preparedness in the event of an urban emergency. Included with the WFA class is 140 page book which students may pick up before class. Participants will receive a ASHI (American Safety and Health Institute ) Wilderness First Aid certification at the completion of class. The Heartcode BLS, ACLS, and Heartsaver courses require the student to complete Part A online. Once you have finished the online course and are ready for your skills practice (Part B-Practice) and Part C (Skills Test) then print out your certificate of completion and schedule your appointment with us. The following course are available in e-learning format; Heartcode BLS, Heartcode ACLS, and Heartcode Heartsaver CPR/AED/First Aid. The link to access and purchase all Heartcode Part A online classes can be found at https://www.onlineaha.org/courses. Are you interested in becoming an American Heart Association (AHA) or American Safety Health Institute (ASHI) Instructor? ​BLS Instructor: The American Heart Association BLS Instructor Course certifies the participants to teach the AHA BLS Provider courses in addition to the Family and Friends CPR/First Aid and the Bloodborne Pathogens course. Heartsaver Instructor: The American Heart Association Heartsaver Instructor Course certifies the participants to teach the AHA Heartsaver programs including Adult CPR, Child CPR, Infant CPR, AED use, First Aid, pediatric CPR & First Aid, and Blood Borne Pathogens. BLS and Heartsaver Dual Instructor: The American Heart Association Dual Instructor Course certifies participants to teach both the BLS CPR and Heartsaver program curriculum. Pet CPR and First Aid: The Emergency Care Safety Institute (ECSI) Pet First Aid and CPR class is designed to help pet owners and pet lovers be able to provide temporary and urgent emergency care to their pets. Topics covered in this class include injury prevention and disaster preparation, personal safety precautions to help pet owners identify and minimize risks, and a wide array of pet emergencies including bleeding and bite wounds, cardiac arrest, choking, burns, poisoning, trauma and more. Advanced Bleeding Control: The American Safety Health Institute (ASHI) Advanced Bleeding Control training program is designed to provide detailed instruction on the control of severe external bleeding, including the use of direct pressure, commercial pressure bandages, tourniquets and packed dressings. The programs are ideal for those who have a greater than average chance of witnessing an injury event in which severe bleeding occurs, such as law enforcement, private security, workplace emergency response team personnel and staff at large events or campuses. ​Do you need to order a textbook for class or just for review? ​​Are you ready to register for a class? Give us a call at ​210-380-5344 ! Purchase of a course is a NON-REFUNDABLE ticket but may be rescheduled within 60 days from purchase. Dynamic Instructors: Our classes are fun and interactive. And everyone will get the opportunity to practice extensively on the manikins. Convenient Times: We offer morning, afternoon, evening and both weekday and weekend classes. ​American Heart Association (AHA) Classes: If you require specific training through the AHA network we can help. We are a satellite training site for AHA and offer various AHA courses. American Safety Health Institute (ASHI) Classes: We are also an authorized ASHI Training Center and facilitate various ASHI certification classes including Wilderness First Aid and Advanced First Aid. American Red Cross (ARC) Classes: We are an American Red Cross Licensed Training Provider (LTP) and facilitate various ARC certification classes including BLS for Healthcare Providers, ACLS, and PALS. In addition, we also offer the BLS Instructor Development/Certification course. Small Class Size: We understand that everyone has a different learning style so we choose to keep our class size small, with most classes under 9 students, in order to optimize personalized learning and instruction. We Can Come To You: If you have a group or company and would like us to come to you-no problem. For groups of 8 or more, we will travel any time that is convenient for you and your organization.